Hope all is great in your world. Whew, almost the beginning of July and no casualties on North Loop as of yet. Whoppee!!! We sent some more funds to Prairie Dog Pals yesterday along with a copy of the news article. Hope we get a few more donations in so can complete paying them for promised funds. Looks like we still owe them around 811.16. 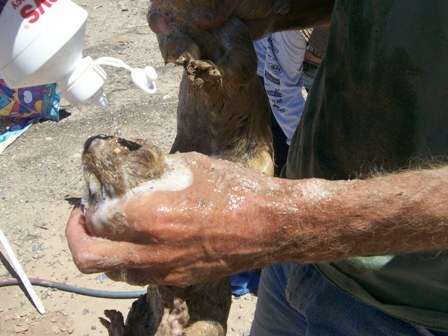 Tomorrow will be our second day of Prairie Dog Capture in Bosque Farms. It will be an early day for those of us working to capture as many PDs as we can. And it is going to be a hot one!!!!! We will have a canopy set up tomorrow with an information table and a place for volunteers and the captured PDs to gain some relief from the sun. Wow, it was hard to imagine how much we would miss the prairie dogs that were in the field close to North Bosque Loop. The daily experience of watching them feed, seeing the sentries watching over the colony, the yearly baby PD watch, is one that contributed to us all. Would be great to have a Prairie Dog Park in Valencia County as a source of education, conservation support and viewing enjoyment. The Prairie Dogs that where captured last weekend are off to a sustainable home, one with healthy native grasses and no cars. June 15th is the date of our last PD capture in this area. We could still use a few volunteers. If you are interested please e-mail me at bfprairiedogs@aol.com. Thanks so much for your support. I asked David what to title the post today. He said it has to have something about the beach, meaning the sand and sun, no water in site, except for the soapy water going down the PD holes. We had a successful day today. Captured many Prairie Dogs and they are off to be staged for a week and then to their new home. One with grass and no cars!!! A special thanks to Prairie Dog Pals, Yvonne and Eddie, Lee, David, and to John who took wonderful photos today. Next Sunday we will be doing an additional PD pick up. Today I visited the Prairie Dog Pals facility and had a long chat with Yvonne and Eddie. We coordinated logistics and have set two dates for PD pick up. One will be this coming Sunday and then another in a week. I met many Prairie Dogs today and was impressed with PDPs facility and the depth of their care. While I was there I had the opportunity to hold a prairie dog, one that cannot be released because of injuries. He was tame and handle able. Prairie Dogs in the wild are not meant to be handled. While I was holding him he started to gently shake. I told Yvonne I thought he was scared, she said no he is purring. Amazing Prairie Dog Purrs! Today, thanks to Prairie Dog Pals, the Bosque Farms Dogs will have a new and safe home to be relocated to. Our biggest need currently is donations. We have raised 664.41 to date!!! 100% of the funds we raise will go into this project. We have finally set up a donation link that will accept all credit cards and Paypal.This is a key and vital component to our project. We have a goal of raising $7,000 to move all the PDs in our neighborhood to safe ground, every $35.00 we raise moves a prairie dog to safe ground. A big thank you to Lee for being our landowner liaison in obtaining permission for this move. And thank you to Mr Trujillo and Mr Tabet for permission, we appreciate their generosity. And thank you to Prairie Dog Pals for their continued partnership. I will get pictures up this week of the Bosque Farms Prairie Dogs and the conditions they are currently living in.